Prospectus: The Civic Center Art Exhibition celebrates the abundance of artistic production within the Berkeley community. This annual exhibition is produced through a collaboration between Kala Art Institute, the Civic Arts Commission and the Civic Arts Program. 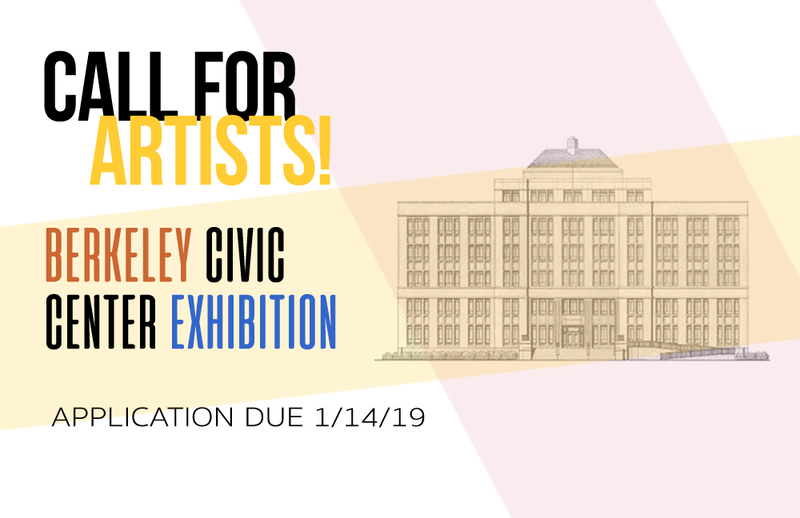 Artists will be selected by a jury to exhibit their artwork in the Martin Luther King Jr. Civic Center Building at 2180 Milvia Street for approximately one year, through February of 2020. The artwork will be installed on all six floors of the building including the Mayor and City Council wing on the fifth floor. The exhibition will be featured on the City’s Civic Arts Program website and linked to Kala Art Institute’s website. The Civic Center Building is not open to the public, however tours of the exhibition may be arranged by calling the Civic Arts Program. All selected artists will receive a $150 honorarium. Media: All 2-D media and 3-D media in compliance with size, presentation and weight restrictions described in this document. Eligibility: Open to all artists living and/or working in the City of Berkeley. THERE IS NO ENTRY FEE TO PARTICIPATE! Application Deadline: Monday, January 14, 2019 by 5:00 pm. Entries must be uploaded to Slideroom. Applications sent via mail or email will not be accepted. How to Submit: Submit entries via Slideroom at https://kala.slideroom.com. You may submit up to 5 images. For best quality viewing please submit images in the highest resolution possible (150-300 dpi), up to 5mb and in .jpg, .png or .gif format. For further questions please click here. An application workshop will be held on Thursday, November 29 at 6:00 PM at Kala Institute Art Gallery, 2990 San Pablo Ave, Berkeley, CA 94702. Tel: (510) 841-7000. – All artwork must be created within the last 5 years. – Selected 2-D work must be professionally framed (if applicable) and ready to hang. Colored mats are discouraged. Artists must provide their own pedestal and vitrine for selected 3-D work, if applicable. – Ready to hang, including mounting hardware. – The work selected will be appropriate to a public space and a diverse audience. The work should be of the highest quality and reflect the aesthetic and cultural values of our unique community. – Work submitted must be available to be on loan for the entire year. Terms: When you apply to this Call for Artists you agree to allow the City of Berkeley to use the images and information submitted with this application for their review process, and also to promote the exhibition, which may include use of the submitted images throughout the City of Berkeley, on the City of Berkeley website or on printed materials. You also agree that the work submitted is your own and does not infringe anyone’s copyright or ownership. All information contained herein does not constitute either an expressed or implied contract. The provisions of the Call for Artists are subject to change. The Civic Arts Commission reserves the right to reject any entry submitted to this Call for Artists. Civic Arts Commission Guidelines: Artwork is selected on its aesthetic merits. Art will be chosen with appropriate regard for the nature of the space and the audience. The display area is within a functioning civic office building. Artwork must not depict violence, sexual imagery or negative portrayals of any cultures or peoples. Selection Process: All applications submitted by the deadline will be reviewed for completeness, and screened by a selection panel comprised of art professionals. Contact Information for inquires and/or mail: The Civic Arts Program and Civic Arts Commission of the City of Berkeley contracted with Kala Art Institute, a Berkeley-based community non-profit arts organization, to assist with this process www.kala.org. For questions about the Call for Artists please contact Claire McPherson at Kala Art Institute at claire@kala.org or by phone at (510) 841-7000. This is a public art project of the City of Berkeley Civic Arts Commission.